Spiced Blood Orange Marmalade - I just can't get enough! - Canning Homemade! Home » blood oranges » Marmalade » Spiced Blood Orange Marmalade - I just can't get enough! Spiced Blood Orange Marmalade - I just can't get enough! recipe were a fire of yellow, reds and orange. I knew that this was going to be a fantastic and colorful marmalade in the jar and wanted to do a bit different recipe to change up the spice to marry with the sweetness. Here is the recipe and the process I used to get this gorgeous fruit into jars. Also, I have taken some advice and started using organic cane sugar in my jams and pickling which hasn't changed the flavors but I know its in there. You can use regular sugar in the same quantity as I have not noticed a difference in the sweetness in the overall flavor and gel point. 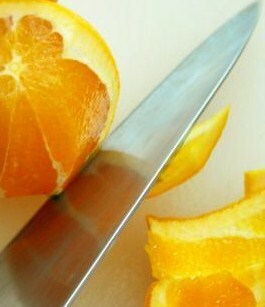 Begin by cutting away the rind of the orange and dicing the meat of the orange into small pieces (see above). Set aside the diced orange and put the rind in a small dutch oven with the water and cloves. Note: Usually I trim the rind with a vegetable peeler dice it in thin strips, but I decided not to add the rind this time to the recipe. This time you will use it to infuse the peel which has pectin in it. On medium heat cook the rind and cloves for 20 minutes on a medium simmer. Stir occasionally. After the 20 minutes strain the liquid using a strainer into a bowl and return only the liquid back to the pot and back on with a low flame. Add the diced oranges and sugar. Bring the flame up to medium again and cook for about 20 minute till the mixtures is boiling. Use your candy thermometer to get the recipe to 220 degrees or use the gel point plate trick (see gel point in the label section) to get the recipe to the desired consistency. Sterilize 2 half pint jars and ladle into jars clean the rims, add the lid and rings, and waterbath for 10 minutes.